The fourth annual Morningside Lights took place September 19-26, 2015. Artists Alex Kahn and Sophia Michahelles of Processional Arts Workshop returned once again to lead free public lantern-building sessions, teaching community members artistic fabrication techniques and helping bring their ideas to life. This year's theme, New York Nocturne, inspired participants to create a fantastical evocation of the city after dark. 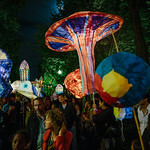 On Saturday night, a taco truck, a giant rat, the Statue of Liberty and 50+ other lanterns danced their way through Morningside Park and Columbia's campus to the music and rhythms of SugarTone Brass Band and the Marching Cobras of NY drumline.